Western Australia is set to return to the ballot-box after their Senate election was deemed void. 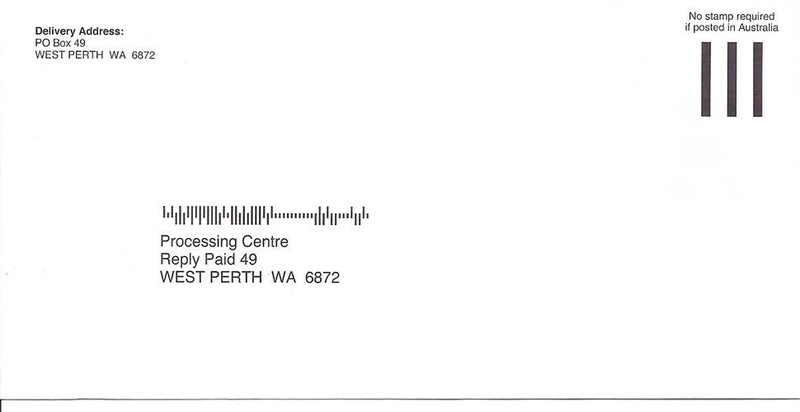 The usual slew of party letters has been noted by WA locals, but what has confused some is why exactly the Liberal Party opted to have their own address on the return envelope for postal vote registration, rather than the independent body – the AEC. 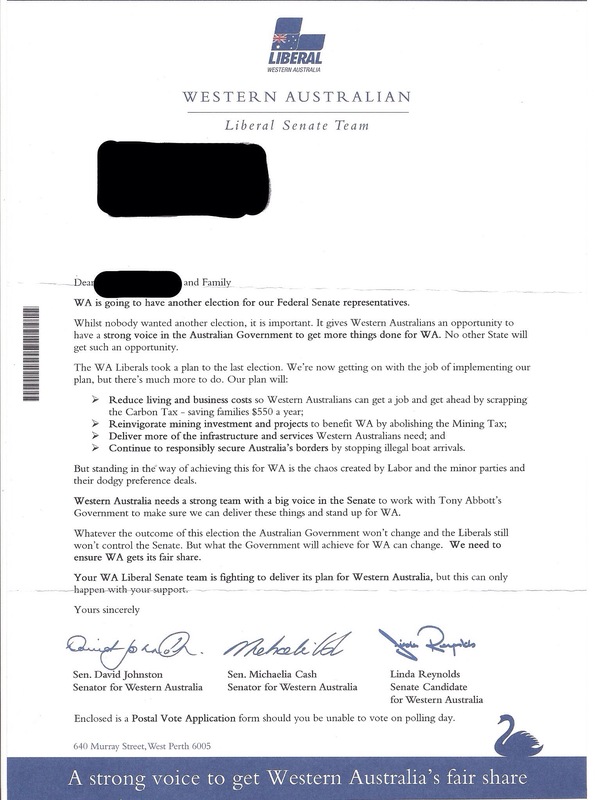 The Facebook page, Tony Abbott’s Lies and other Liberal Promises was provided with scanned images of what had been sent to WA residents from the Liberal Party and has kindly passed them on. 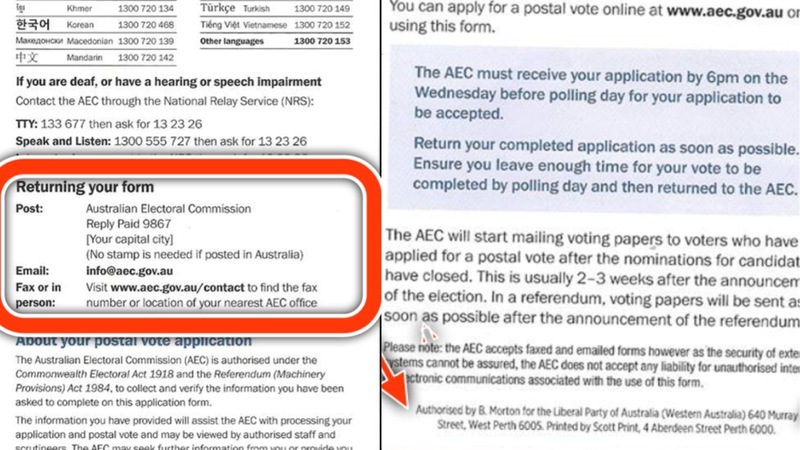 What was of concern was that the return address envelopes are addressed to the Liberal Party, not the AEC. The actual AEC address is enclosed inside the leaflet, meaning it is more likely that people would simply use the return envelope. While this is completely legal, and has probably been practised by other parties, it is of concern that the system relies on ‘trust’ that the Liberal Party will handle the forms in the appropriate way and forward them on to the AEC. The LNP letter that was enclosed with the postal vote registration form. 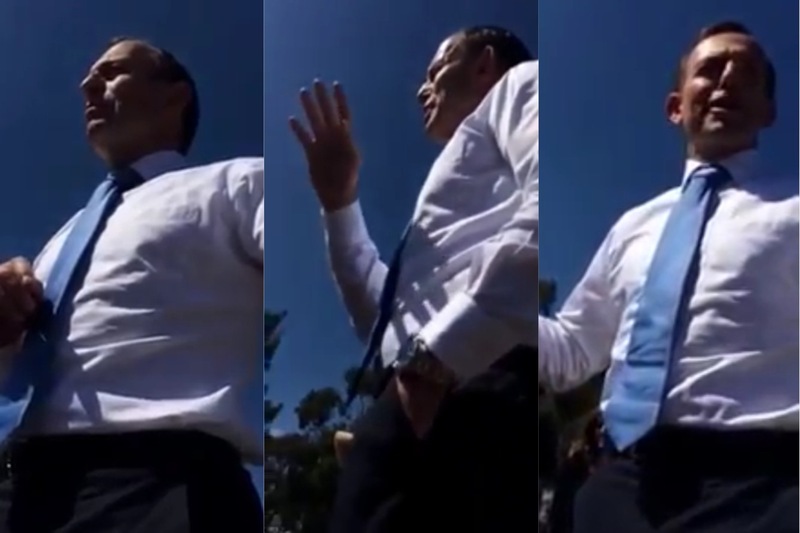 It has been suggested that in this scenario, because the Liberal Party will then know your intention not to attend and vote on the day, they could enlist ‘stooge’ voters to use your name and address to vote for the Liberals at the polling booths – perhaps multiple times. The question of whether or not this is possible is easy to determine – we know that multiple votes were allowed in the most recent Federal election, with nearly 2000 Australians caught and with one even admitting to having cast 15 votes. What we want to know is whether or not something been done to prevent history repeating – have they taken measures to disallow this disaster from happening again? 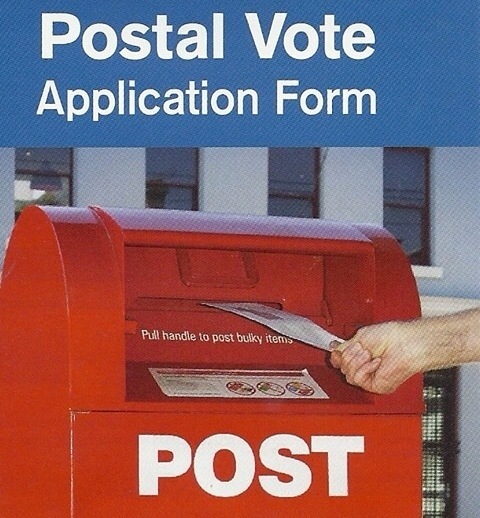 Be careful how you return your postal vote registration forms. Make sure to address them to the AEC directly or simply save yourself the hassle and complete this process online on the AEC website. This entry was posted in Politics and tagged AEC, auspol, ausvotes, election, lnp, politics, vote, WA election on March 6, 2014 by leesalittle.